Quadrivium will perform two shows this weekend, one in Bayfield and the other in Durango. Animal lovers, rejoice: A concert just for you is on the immediate horizon. Titled “Wild Kingdom,” the concert will feature “music about all things that scurry, bound and fly,” said Kerry Ginger, one of the organizers of Quadrivium, a professional vocal chamber music ensemble based in the Four Corners. This weekend, the ensemble will present Part II of its 2018-19 season: Flora and Fauna. Last September, Quadrivium presented Part I, In Bloom. On Saturday and Sunday in Bayfield and Durango, twin concerts will entertain audiences in both communities with music from the Renaissance to Ravel, from a bawdy medieval bestiary to a plaintive musical prayer by a cat for a simple saucer of milk. As devoted pet owners themselves, the husband-and-wife team, mezzo-soprano Ginger and tenor Erik Gustafson, along with soprano Charissa Chiaravalloti, and guest bass-baritone Ryan Downey, will continue to fulfill Quadrivium’s commitment to high-quality performances of both familiar and rarely heard music, student engagement and community involvement. Organized in 2016 for the joy of singing and to present infrequently performed vocal repertoire, the group has performed throughout the Southwest and sings a cappella. All members have professional careers and teach at the university level. 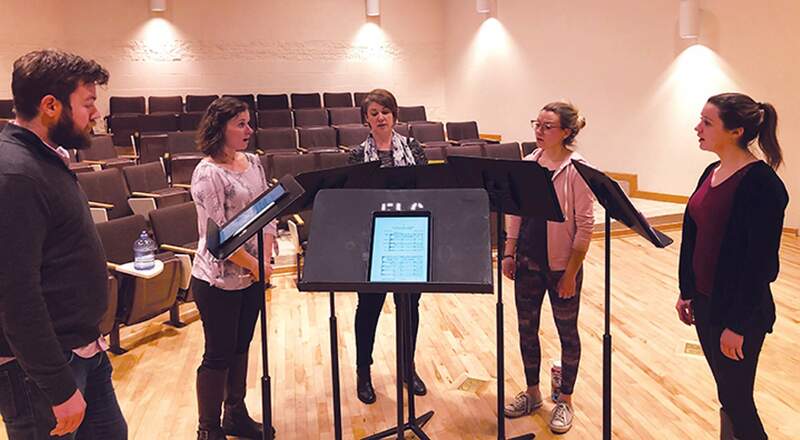 The core trio of singers, Chiaravalloti, Ginger and Gustafson, are affiliated with Fort Lewis College. Downey, a colleague and friend from graduate-student days in Arizona, is active as a soloist, teacher and ensemble singer in the Bay area. To fulfill the Quadrivium goal of outreach and education, the ensemble will present a short program concert version at Durango/La Plata County Senior Center. Thursday, Downey gave a master class at FLC to selected voice students. Over the weekend, the ensemble will integrate five FLC student vocalists in a side-by-side component of the concert. The entire community package is co-sponsored by the Artist-in-Residence program at FLC and Pine River Library in Bayfield. WHAT: Quadrivium presents “Wild Kingdom,” a concert that explores the majesty of the natural world. Works by Ravel, Schumann, Hindemith Palestrina and others. WHEN/Where: 6:30 p.m. Saturday, Pine River Library, Bayfield; and 3 p.m. Sunday, Fort Lewis College, Roshong Recital Hall. TICKETS: Pine River Library show, free; FLC recital, adults $15, free for children younger than 18 and FLC students with ID, at the door.